Developing a web product means you are launching it to millions of people across the internet space. This means that broader the audience, higher the need for web application security becomes. We don’t learn until it happens to us, it’s human nature. We are talking about hackers and attackers who are tempted by your web presence and popularity. So, one shouldn’t wait for some kind of security breach to occur before considering it as a priority thing. People usually don’t pay too much heed to web application security issues while developing a web app. That’s why we are here to talk about what should you be beware of and how to track your actions for protecting your web-based application. Web app developers should ideally have a “defensive and proactive” approach to deal with such security threats. Our intention is to spark a healthy ounce of paranoia among the technology industry which would help in avoiding unnecessary attention from the world wide web. 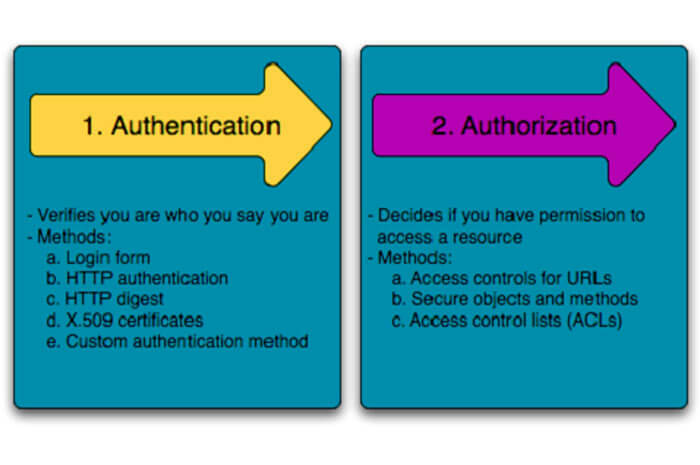 Authentication: Validating your identity while using your details such as username or user ID and password. It could also be anything apart from just a password such as security questions, fingerprint access etc. This helps the system to further process and cross-check your credibility. Authorization: Once authenticated by the system, you should get the complete access to all the resources such as files, information, database etc. However, authorization has the role of verifying the rights to access any specific resources and permission to perform certain actions.In short, authentication means identifying the entity, whereas the authorization is understanding what this entity can perform. Injection Flaws: Injection flaws is a type of security vulnerability that allows a user to break out of the web app context. It is a royal failure to filter the untrusted inputs. It might happen when you allow the unfiltered data to the browser, the SQL server or anywhere else. The issue is that the cyber attacker can inject commands which would lead to the loss of data. You should be filtering every single input thoroughly without leaving even a single command behind. URL might have the session ID. The password may not be encrypted either in transit or storage. Predictable session ID giving easy access. Session hijacking or fixation might be possible for the attackers. The best way to ignore such vulnerabilities is by using a framework. Sensitive Data Exposure: The web application security is all about crypto and resource protection because when attackers put their eyes on the weakly protected data, they won’t spare a thing. Sensitive data must be encrypted at any point of time, whether it’s in transit or at rest.This kind of vulnerability is very hazardous for healthcare and the financial sector, so web app developers should extra careful while developing such apps. Broken Access Control It occurs when the action limitations of the authenticated users aren’t checked properly. If web developers don’t fix these limitations, then malicious software takes access of the unauthorized data (sensitive accounts and files). Security Misconfiguration: This issue is commonly appearing in web apps. Security misconfiguration means that some default cloud storages, configurations, or HTTP headers may be fixed in an insecure manner. So, the developers should check and update all of the frameworks and libraries regularly. Components with Known Vulnerabilities: Such components expose the web application security with known vulnerabilities like deployment or maintenance issues. A developer should conduct some research or auditing before incorporating any new code. A new code fetched from some random forum or a person might sound like an easy idea, but it leads to a higher risk of web app security.It is more commonly found where websites get exposed to the outside administrative access and eventually get owned by the third party. Your web application is prone to malware attacks 24*7 across the globe. With the increase in technology, the number of websites is also increasing exponentially with so much sensitive data. You need to be more careful in protecting the information. You just need to find the experienced and updated web app developers who have a thorough knowledge of how to secure the web application. BluEnt is a web application development company based in North America. We have a strong team of web app developers with relevant experience. If you want to explore more on this, reach us here. Why Businesses Should be Using Desktop Sharing Tools?